All vehicles including marine engines are vulnerable to injector clogging, and most likely to experience driveability problems. 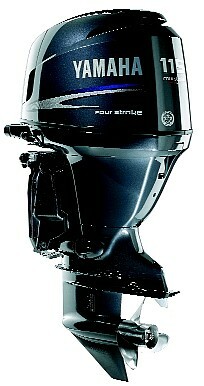 In the marine environment, usage or lack of, along with water in the fuel tend to accelerate or agrvate this condition. Flagship Fuel Injectors Service can service all Solenoid type of Injectors except (Pump Style Injectors Ficht / E-tec). Flagship Clean and Flow service is the only approved service for their dealers, Reference Yamaha Tech Exchange 02005-008. In addition to Yamaha Injectors we can perform this service to Mercury Outboards both EFI and Optimax, MerCruiser, Cobra and Volvo inboard and Sterndrives. Indmar, Crusaider and Marine power Inboards and including Suzuki and Honda Outboar as well. Where do the deposits come from? Mostly from the fuel itself. Gasoline is a mixture of many different hydrocarbons, including oilfins, which are heavy, waxy compounds. The heavier the hydrocarbon, the more energy it yields when it burns. When the engine is shut off, the injectors undergo heat soak. Fuel residue in the injector nozzles evaporates, leaving the waxy oilfins behind. Because the engine is off, there is no cooling air flow through the ports and no fuel flow through the injectors to wash it away, so heat bakes the oilfins into hard varnish deposits. Over time, these deposits can build up and clog the injectors. The first step in the test process is to install the injectors on Flagship Marine's computer-controlled injector flow-testing equipment. 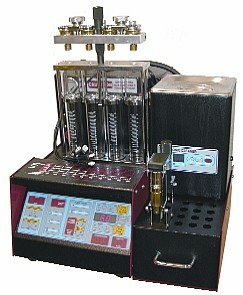 A unique, gasoline-like test fluid is pumped at a precisely controlled pressure (identical to your engines) through the injectors while they are pulsed by injector-drivers built into the equipment. The volume of the fluid passed through the injector is accurately measured for a set amount of time and from those figures, fuel flow is derived. During the flow-test, the injector spray patterns are visually inspected and analyzed by Flagship's technician using both bright room light and a strobe light. After the initial flow-test, your injectors are transferred to an ultrasonic cleaning machine. They are submerged in cleaning solution and subjected to ultrasonic waves. The solution and the ultrasound aggressively clean the internal and external parts of the injectors. Finally, the now-clean injectors gets a new basket filter and are reinstalled on the flow-tester and run again, to verify the fuel flow rates and spray pattern assessments for each injector tested. Data for each injector is collected and compared to collected data of new injectors. Units of measurement are in fuel flow rate values in cc/min. The charge for Flagship's Clean and Flow Service is $50.00per injector retail. Turn around time is 24 hrs. If we find a bad injector we will advise you of our findings.